Established landscape trees and other woody plants, in general, have effective drought resistance mechanisms and require only modest amounts of water to perform acceptably in landscapes, but the perception is they need greater amounts of water to perform well so they are usually over watered. This misperception occurs because when the weather is warm and sunny and soil moisture is plentiful, these plants will simply use more water than they require to perform acceptably. Detailed information on easily, scientifically, and accurately estimating the water required by landscape trees to perform acceptably follows below. Research on landscape tree water demand and water use physiology shows a single Plant Factor (PF) of 0.5, or 50%, to adjust reference evapotranspiration (ETo), as in ETo Χ 0.5, produces an accurate estimate of the amount of water landscape trees require to provide acceptable landscape function and performance in most of California. This PF applies to all established, climatically-adapted trees, whether they are traditionally used species or so-called drought tolerant, low-water use, native, or California Friendly trees. The most straightforward, scientific, and accurate method for estimating landscape tree water requirements follows the SLIDE (Simplified Landscape Irrigation Demand Estimation) approach, or the ANSI/ASABE S623 Standard - Determining Landscape Plant Water Demands, which use the single 0.5 PF. In addition, Easy Calculators have been prepared to eliminate the math needed to follow the SLIDE and ANSI/ASABE S623 Standard approach for estimating the daily and weekly water requirements of trees in common landscape scenarios. The numbers produced by the calculators are useful in estimating the amount of water required to irrigate trees, but they do not tell you everything needed to establish the timing or interval for applying water. Using one PF value for all tree species greatly simplifies the process for estimating their water requirements, but it may seem unusual and imprecise since many existing plant lists and plant water requirement data bases provide plant-specific PF values. It is important to understand there is no scientific basis for the numbers or estimates provided in these lists and databases, including the values listed in the Water Use Classification of Landscape Species (WUCOLS). Also, ETo only marginally represents the weather-related water demand of landscape trees in an arid climate like California's, so fine tuning a PF for each tree species adds little if any accuracy to the estimate. Likewise, there is no science-based reason to apply additional ETo adjustment factors such as "density" factor for variation in planting or canopy density. Tree water demand is met by water available in the soil that may be replaced by precipitation, irrigation, or a combination of the two depending on the local climate and season of the year. In most areas of California, a portion of trees’ summer soil water demand will need to be replaced by irrigation. 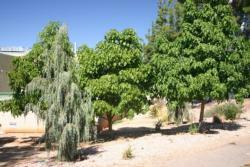 The inherent drought resistance capabilities of landscape trees allow flexibility in scheduling their irrigation. Although all trees provide acceptable landscape performance and function with a water amount of 50% of ETo, some species will remain acceptable for long periods if they receive somewhat less than this amount of water. This is because there is variation among tree species in their response to drought (prolonged, severe soil dryness). Most established landscape trees tolerate dry soil for a few weeks to a month with little or no injury or loss of performance, and there are some that can tolerate this condition for several weeks or more before they begin to show symptoms of water stress. Depending on the species, trees that have run out of water and are at their drought resistance limit will show wilting, thinning canopy, marginal browning (burn) on leaves, and/or dropping of foliage. Tree species’ ability to resist drought. 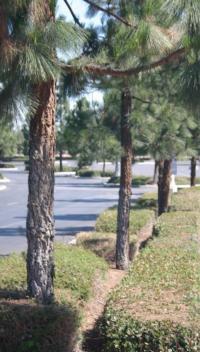 Reducing irrigation 10%-25% often has little effect on trees when imposed for a period of a few months in the summer. If irrigation is stopped or reduced during warm months of the year, trees located within the turf will likely become water stressed within several weeks if there is no significant precipitation. Water stress will develop more slowly if watering is stopped or reduced in in the cooler months versus the warmer months of the year. Having the soil fully wet in the root zone before reducing irrigation will increase the chances trees will tolerate the water reduction. Trees with relatively dense, deep, and extensive root systems located in loam or clay soil that is fully wet at the time irrigation is reduced will resist drought better and maintain their performance longer. Likewise, many tree species possess physiological traits that enable them to reduce water loss or to tolerate lower internal water levels so that they perform acceptably for a longer period of water shortage than trees without these traits. Tolerance of long-term dry soil conditions is especially common in desert-native species. 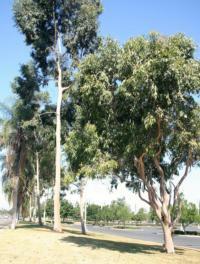 Although there may be interest in using desert native trees outside of desert areas as a means of reducing landscape water demand or adding highly drought resistant plant material to non-desert plant palettes, desert-native trees may not provide acceptable performance reliably in non-desert environments. Turfgrass irrigation may be stopped or greatly reduced in street medians and other general lawn settings to conserve water during severe drought. Trees located in turfgrass that has had the irrigation eliminated will face competition from the turf for available soil water until soil water becomes so limited that the turf goes dormant or dies. Turfgrass usually turns brown and goes dormant within 2 to 4 weeks after irrigation and precipitation stop in the growing season. The trees will likely begin to experience moderate to severe water stress within a few weeks after this. When the decision is made to allow turf to die from drought, immediately killing it using a registered herbicide will eliminate its competition with the trees for the remaining soil water and extend the time before the trees become severely water stressed. Information is available here on managing turf during drought. The water requirements of the remaining trees can be estimated using Equation 1, 2, or 3 described later in this page for trees in different landscape situations. If the tree canopy covers at least 80% of the ground, irrigation for trees can be effectively applied using the existing overhead irrigation system previously used to maintain the turf. Where tree canopy covers less than 80% of the landscape surface or when more efficient irrigation delivery is desired, the overhead irrigation system can be retrofitted with a surface drip irrigation system using tubing with inline emitters. A 2- to 4-inch deep layer of organic mulch should be placed over the area and drip lines to reduce evaporation and weed growth. 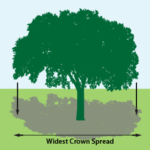 As a rule of thumb, the drip system should be designed to wet at least 50% of the soil surface covered by a tree's canopy, and ideally, a portion of the soil surface several feet beyond the canopy. The less of the tree root system covered by emitters the more frequently the area will need to be irrigated since only a portion of the former root system will be receiving water. A professional irrigation designer or irrigation consultant can be helpful in designing a retrofit irrigation system tailored to a specific landscape situation. ETo is inches of historical average or real-time evapotranspiration for the period of interest. PF is the Plant Factor for the turf (0.8 for cool-season grasses or 0.6 for warm-season grasses). LA is the planted area, in square feet. 0.623 is the factor to convert inches of water to gallons. Isolated trees are those that are widely spaced with no other plant material under or around them, and, when multiple trees are present, their collective canopies cover less than 80% of the landscape surface. Drip irrigation applied under the canopy area and sometimes slightly beyond is usually the most efficient method of watering these plantings. PF is the Plant Factor for established landscape trees (0.5 for all trees). R is the radius of the tree canopy in ft., which = canopy diameter in ft. ÷ 2; use widest crown spread as the diameter. R × R × 3.14 = the area of the circle created by the tree’s canopy projection over the soil. Closely spaced trees and those in mixed landscape plantings (trees with shrubs, vines, groundcovers, herbaceous perennials, and/or annual bedding plants) are those located where the tree canopies or that of the mixed planting covers 80% or more of the landscape surface. The estimated water requirement for these plantings is based on the total landscape area and the PF for the trees or the plant type in the mix with the highest PF. If all plants are trees, shrubs, vines and groundcovers the PF is 0.5. When irrigation is planned, mixed plantings should be designed so that the plant types with similar water and irrigation management requirements are grouped in each irrigation zone (controller station or valve). PF is the Plant Factor for trees in tree-only plantings, or the PF for the plant type with the highest PF in a mixed planting (0.5 for trees, shrubs, vines, groundcovers, and herbaceous perennials; 0.8 for annual flowers and bedding plants). LA is the surface area covered by plant canopy or the planted area, in square feet (the equation assumes plant canopy covers at least 80% of the landscape area).